Article – Are you getting your fill? Of Vitamin D that is! Most people know that being exposed to the sun’s rays can be harmful with its increase risk of skin cancer, but they may not know there’s a risk of too little sun too. Sun exposure is actually beneficial when obtained in small doses, such as 15 minutes or less several times a week. The sun’s ultraviolet rays actually trigger vitamin D synthesis in the skin. Vitamin D is important because it helps us absorb calcium from the digestive system for our bones. The days get shorter as winter approaches, and people have less exposure to the sun. Even if they are getting sun exposure, the winter sun is too weak to be medically beneficial. Conditions may include, a vitamin D deficiency, known as ‘rickets’ in chil- dren and ‘osteomalacia’ in adults which prevents new bone tis- sue from hardening. It can also result in diffuse body pain, bone loss and muscle weakness, which could increase the possibility of falls. Vitamin D is a fat-soluble vitamin found in many foods and which can be made in your body after exposure to ultra- violet rays from the sun. Vitamin D helps the body maintain normal blood levels of calcium and phosphorus. It promotes calcium absorption and helps to form and maintain strong bones. The skin of older adults – aged 50 and over, does not synthesize vitamin D as efficiently as it use to and the kidneys are less able to convert vitamin D to its active hormone form. People with darker colored skin, have a higher melanin content which also reduces the skin’s ability to produce vita- min D from sunlight. Vitamin D is also a fat-soluble vitamin, so people with a reduced ability to absorb dietary fat, such as those with Crohn’s disease, Cystic Fibrosis, Celiac disease or liver disease, or those who have had a portion of their stomachs or intestines removed, may not adequately absorb vitamin D.
So, how much do you need? And where do you get it? 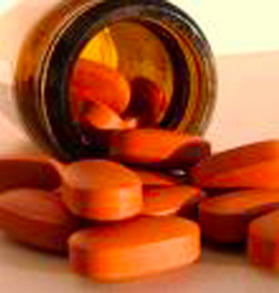 The current recommendations are: up to the age of 50, people should get at least 200 IU of Vitamin D daily. Adults 51 – 69 require 400 IU daily, and those over the age of 70 – 600 IU. Many experts in the field recommend 1000 to 2000 IU per day and some patients may even need more. The ‘safe upper limit’ for vitamin D is 2. 000 IU/day and although there is a wide margin of safely, taking too much vitamin D can lead to toxicity. Symp- toms may include nausea, vomiting, poor appetite, constipation, weakness and weight loss. It can also cause heart rhythm abnormalities and confu- sion. Obviously exposure to the sun provides most people with their vitamin D requirements. But if a Hawaiian holiday isn’t in your future, than look no far- ther than your refrigerator. Egg yolks, sardines, mackerel, salmon, herring, bottles fish oils, shrimp, chicken livers, oysters and vitamin D fortified foods such as orange juice and milk products. It may be difficult to get your daily recommended amount from foods sources, so check the vitamin aisle for multi- vitamins which contain vitamin D or take additional vitamin D on its own.